We, the MYP 1 of MBIS 2018~2019 have gone to Phaltan for our field trip and this is an overview of our experiential learning trip, which was full of adventures, fun and new experiences. 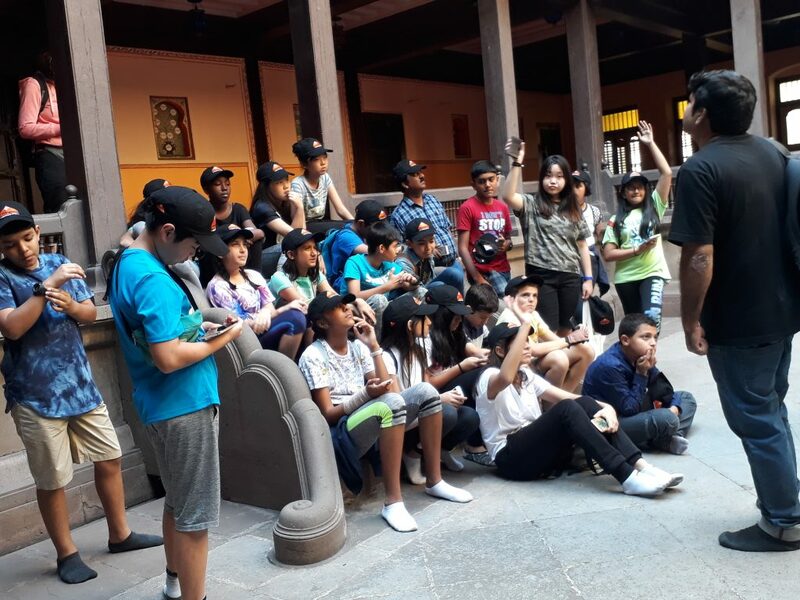 When we got to the Rajwada, we were very interested as it was the first place we went to, we were all taking pictures, and some people were taking videos. We had some time to take pictures, and then we took off our shoes, went inside a small temple next to the Rajwada, and saw it. Then, we went inside the actual palace. The palace had many rooms and most of them had windows strategically placed to overlook a central courtyard. The lowest floor had the central courtyard and a corridor with painting and a carpet around it. The second floor had a bunch of different rooms such as a dining room and a bedroom and some of them had windows looking down at the courtyard. In addition, a room had many objects that were made of silver. After the tour, we went down to the central courtyard and got a little bit more information from the Trailblazer Guides, and then we boarded the bus and went back to the hotel. On day 2 of our field trip, we went to Krishi Vidhyan, Krishi Vidhyan is a awarded organization which is doing research into growing fruits and vegetables organically and finding ways to increase yield, for learning about organic farming, aquaculture, agriculture, apiculture, hydroponics, which is our main topic of our IDU. We needed to really pay attention to this trip since this was the main building block for our assessment. Most people did interviews with one farmer and got all the information. Others looked at various signs displayed and learned. This was a huge part of our IDU and everyone learned and reflected on something new. Hydroponics is a technique where you grow plants without using any soil but another medium to grow a plant. You can use coco peat, which is made from the bark of a coconut tree. Soilless culture means farming without using any soil like farming only using water. In Farmer science center, there are lots of farmers who are learning about different kinds of farming like organic farming and hydroponics..
We saw a greenhouse with flowers, capsicum, and orchids grown in coco peat and people giving water full of good nutrients like Nitrogen, macronutrients like NPK (Nitrates, Phosphate, and Potassium). All plants need a certain amount of macro and micronutrients. They mixed all the nutrients like NPK, Nitrogen that are needed for the plants to grow organically into the water so the nutrients can go into the roots faster. The plants will need clean water with nutrients, the sunlight and good coco peat. It will take 2-4 weeks for the plant to grow in the conditions. In addition, the coconut shell can be used to do hydroponics. There were a lot of procedures to grow a plant organically and in hydroponics. For example, you have to change the nutrients and water every 2-3 days. The plants will get bacteria based biofertilizer with water to make it luxurious. If the bacteria grows, the plant will grow and they take water with different kinds of bacteria to see if it is good for the plant. You have to give the right conditions like the temperature for doing hydroponics and they use differently based traps for the pests to be trapped inside a special place. There was much more information in other parts of the learning of farming. For example, Organic farming. So organic farming is when you use everything organic except chemicals for growing the plant such as nutrients from manure and compost pests. If we use organic farming, the foods will be healthy because when we do organic farming we do not use any harmful chemical while farming. We can use animals poop while farming instead of using harmful chemicals. Animal’s poop will fertilize the soil so the plants can grow well. They are experimenting to grow organically plants such as tomatoes, chilies, onions, spinach, eggplant, bananas. Even aquaculture, which is when you grow fish like Catla, L. Rohita. They have a hatching and breeding pools for fish. 2 lac of fish eggs are put into a giant pool. The baby fishes are given to farmer who will grow the fish bigger and then sell them to customers. It is in a circular shape because fish can hatch easily and the bigger fish go into the bigger pool. Clean water, light, and water solubility nutrients are needed to grow fish. There was more information on other subjects of what we learned. We all had an amazing time in the farming lab and got many ideas for our IDU. On the second day of our field trip, we went to the Ferrero factory. We were all so excited about this visit because Ferrero is a chocolate company. Once we got there, we had to wait and watch a video on all of the represent safety procedures. Then a man came and took us to a room that looked like it was the conference room. In this room, they had put out chocolates on the table so they told us we could test them. They also showed us different advertisements of the different chocolates that they represent. Then another person came in and briefly told us about the fire exits of the Ferrero factory and what to do if there is a fire. Then we had to wear a coat and a plastic thing that covers our shoes and after that, we finally started to go to the place where they manufacture the products. Once we reached the manufacturing places, where they pack the chocolates and keep them, the man took us around showing us the different ways they pack the chocolates. We went to the “Tic Tac” and the “Kinder Joy” and how machines pack them. After came back to the conference room they gave us a bag that had the name “Ferrero” on which had a whole packet of ‘tic tacs’, ‘Nutella’, ‘Ferrero Rocher’ and 5 to 6 ‘kinder joys’ in it. We were super excited and happy when we saw the bags on the table and rushed to our sets to grab them. We left the place with huge smiles and rushed to the bus discussing who has which chocolate. 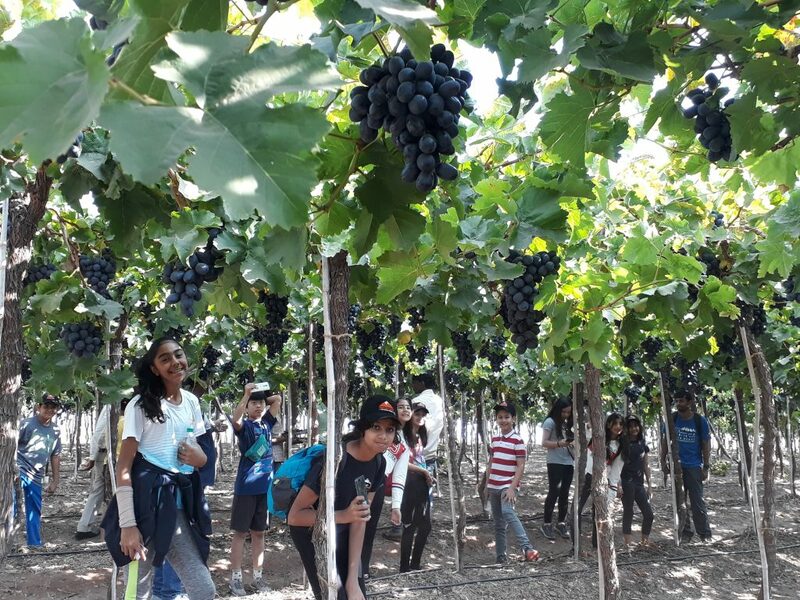 We, the MYP 1 went to a local grape farm to learn about different aspects of farming like how long do the grapes take to grow and how do the farmers live while the grapes are grown. It was a nice, memorable time where we could ask questions freely to the local farmer. Turns out that the farmer owns 20 acres of land covered with 23600 grape vines, grown in a very organic way. We especially enjoyed ourselves when we tasted the grapes directly from the farm: sweet, crunchy and very fresh. They depend on cow dung for manual and micronutrients in the water. There also was a chance to meet the locals who work on the farm. The grape vines were quite low and there were white lusters on the grapes, which protect the grapes to make them sweeter and grow faster, and they are natural wax to protect the grapes so we could not touch the grapes. The grapes take 5 months to harvest, and the life of the grapevine is a minimum of 10 years. In conclusion, we pretty much enjoyed going to the farm and learning about farming since we didn’t have a chance to go to a farm and ask questions or learn about farming until then. Then, we presented to them our activity, ‘dodgeball’. They knew how to play dodgeball so we didn’t have to explain the rules to them luckily and we played. We also planned to play capture the flag but we didn’t play it due to lack of time. Everyone got a chance and it turned out that it was a tie. We wanted to do a tiebreaker round but we didn’t have much time. We went inside and we had a mini talent show. It was a great experience even though I didn’t perform. People did dancing, Zumba, singing, magic and a traditional martial art form from India that women learned in times of war. It is called Mardani. My favourite one was martial art because it was amazing how the performer would swing the sword with such speed and force but still be able to control it. He/She was also very precise because he/she hit his/her target every time. It was then time for the students to be dismissed and go home so we went back to the hotel after we sang the national anthem, they do that every day at the end of the day, said thank you by presenting a ‘thank you card’ and goodbye. We boarded the bus full of excitement to go to the temple and everyone had a smile on their faces. We were going to a temple that was situated on top of a grassy hill. When we reached there, we were shocked to find out how many stairs we needed to claim to reach the temple. A village surrounded the temple and it took us approximately 400 steps to reach the top. The stairs were made up of Stone and were covered in Haldi. At the top, a large Maharashtrian flag was hoisted. While climbing to the top there were small temples situated in different places. Everywhere there were small shops selling various items. We also saw a statue of Umaji Naik. There was a nice view of the city from the top. The word Jay Malhar is chanted all around. Haldi is also being sold in huge amounts. There is a temple of Nandi, the transport animal used by Shiv. The steps are very steep. Everything is made with a maharashtrian architecture. Inside the temple many things were made by marble and Granite. The first God we saw was Khandoba and then we saw the Panchling. We also learned about the Palki, a way of transporting an Idol by humans. There was a river near the temple called the Kara river as well. Overall, the trip was a very good learning experience for the entire class. We experienced and were exposed to different cultures and learned a variety of new information and developed several new skills over the course of 4 days. Visiting the Rajwada Palace, Kishi Vidyan Kendra Hydroponics farm, Jejuri Khandoba Temple and the vineyards was extremely exciting and informative. Meeting the kids from the Progressive Convent School was also really eye-opening as we got a chance to understand the lives of those kids and what they go through on a daily basis in order for education. As a class we were able to bond and strengthen friendships over several occasions, for example, the Talent show which was particularly fun to participate in and watch. This trip really benefited us as a class and was very enjoyable.